The 2013 Jackson Hole trip was an all-Floridian affiar and once again the resort lived up to its reputation as a skiers' destination with plenty of snow and a friendly western flair. After safe travels from Orlando, Tampa, and Fort Lauderdale, our group of 15 settled into their beautiful accommodations at the Snake River Lodge. The resort's welcome reception provided plenty of drinks and food and got us ready for a week of fun. I should mention we got our wildlife sightings started immediately on the bus ride from the airport to the resort. There were herds of elk in the reserve near the airport, several moose laying in the snow just outside of town, and coyotes wandering through the meadows near the resort. With an abundant amount of early season snow, we enjoyed a week of warm spring-like conditions with sun almost every day. With several in our group getting back into the sport after many years away, Jackson Hole provided a perfect "welcome back" to skiing. By the end of the week, almost everyone made a power run down Rendezvous Bowl at the top of the tram. 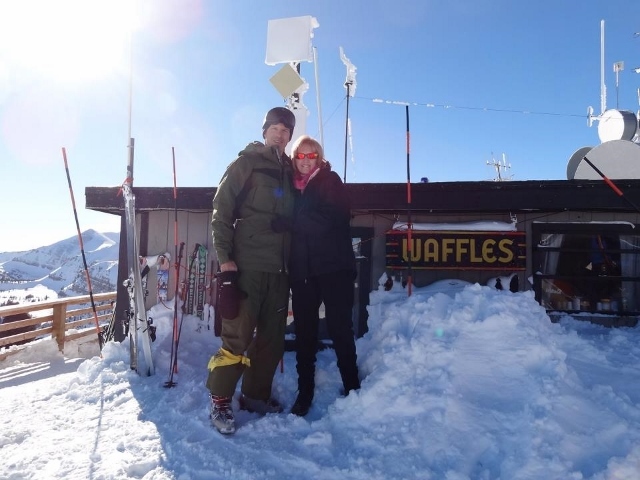 Or at least rode the tram for the spectacular views of the Grand Teton Mountains and the top of the world dining experience in Corbit's Cabin, where they will serve you anything you like as long as it is waffles! Definitely a treat and worth the ride up to the top! For the non-skiers and those who took a day or two off, they also found Jackson Hole to be a winter wonderland. 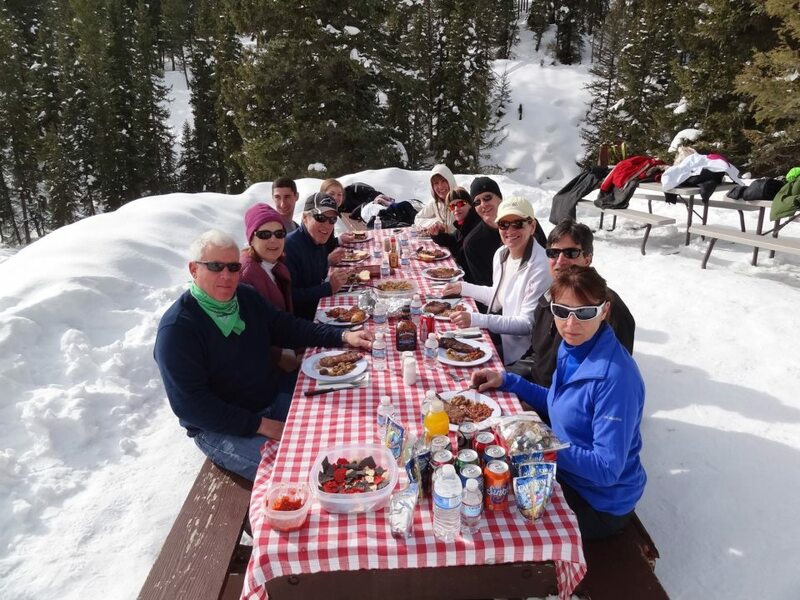 Between the cross country skiing, sleigh rides through the elk reserve, snowmobile rides out to the Granite Hot Springs with a swim and steak lunch, and wandering through the shops and art museums in the town of Jackson, everyone was having a great time. For our midweek group dinner, we took the shuttle into town to the Gun Barrel Steak and Game House. In addition to great food, the restaurant also features many of the full mount game trophies and antique cowboy artifacts from the location's former Wyoming Wildlife Museum. The only disappointment was they did not have the buffalo prime rib available that night. Our group's final gathering at the Swiss-styled Alphenhof Bistro on Thursday came too soon. But everyone enjoyed a couple rounds of drinks and talked about this one to be a trip well remembered.